Wayne Fenton, Director of Architecture at eBay Inc., 在 JAOO 2007 上給了一個 Talk : Operational Scalability in the Next Generation Web World (連結內有側錄影片 + Slides), 雖然影片長達 48 分鐘, 不過內容其實很簡短, 雖然提到很多次 eBay, 但是其實內容是獨立的, 有認真上 Fault Tolerance 的人應該都很容易聽懂內容, 因為都是基本的概念. Operational scalability is the ability of a service-oriented solution architecture to establish and maintain highly efficient and adaptive, cost effective day-to-day operations as the solution grows and scales with time. It is also represents the ability of the architecture itself to be efficiently re-factored to accommodate change and dynamic business requirements. Controlling/updating/tuning live apps without disrupting traffic. 與 Rajith 類似的說法在 CoverPages 的一篇 Sybase 新聞中也可以看到, 不過搞不太清楚算是甚麼, 比較像是文宣, 就不納入參考. Leticia Duboc 的 PhD Work  認為 Scalability 基本上不容易也不適合有一個通用的定義, 需要視乎不同的系統以及面對不同的 Stakeholder 而異. 因此他們也建立了一個 Scalability Framework, 在不同的情況下去 Initiate 此 Framework, 定義不同的 Scaling Dimensions, Independent Variable, Dependent Variable, 以及 Evaluation Standard ( Scalability Claim ). We define scalability as a quality of software systems characterized by the causal impact that scaling aspects of the system environment and design have on certain measured system qualities as these aspects are varied over expected operational ranges. 這樣我差不多可以稍稍做出結論. 基本上可以說有 Operational Scalability 這東西, 也可以說沒有. 在  中基本上是在特定的觀點下, 面對特定的 Stakeholder 去定義 Operational Scalability, 而其中  又更偏向一般性的 Scalability 敘述. 而在 Wayne Fenton 的 Talk 中事實上提到了許多不同的 Stakeholders, 不僅僅是一般的 Customers 而已. 因此他的 Operational Scalability 與其說是以 Stakeholders 作區分, 不如說是以 Operational Reliable Service 為中心思想, 並且放在Community 多變的 Web Service Context 下作說明. Operational 指的是 Service 本身是必須持續運作的, 你幾乎不能考慮停止這項 Service, 必須隨時 Ready for Use, 概念同於古老的 Non-Stop System 概念. 而 Reliable 指的是 Service 可能會更新 Features, 但是不能夠因為新的 Features 而造成不可逆的改變. 這兩項在新時代的 Web Service 上更顯關鍵. 我們很容易有了想法, 很快的成立網站提供服務, 但是隨之而來的使用者人潮跟對於新功能的需求非常難以預料, 這跟過去 Software 面對的情況有顯著不同, Community 的形成之快是超乎預料的, 但是 Community 的衰落之快也同樣難以預期. 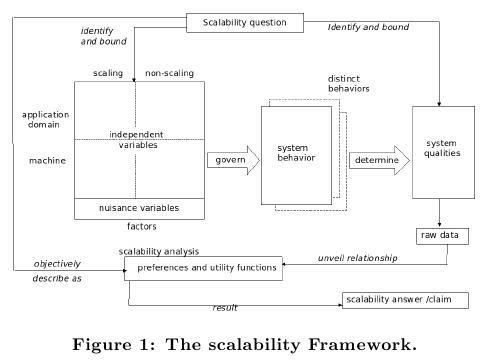 而 Operational Scalability 在此情況下, 我認為其實就是針對 Community Change 的 System Scalability. Rajith Attapattu, "Scaling your system - What I learnt from Dan Pritchett’s (eBay) talk"
This entry was posted on 下午12:36 and is filed under cloud computing , Noun Explanation , software quality , web engineering . You can follow any responses to this entry through the RSS 2.0 feed. You can leave a response, or trackback from your own site.